Sabrina wants to send hugs and kisses to her cousin Evie and wish her a very Happy Birthday! This is my final card that I made using the sketches from Taylor's cupcake challenge anniversary. 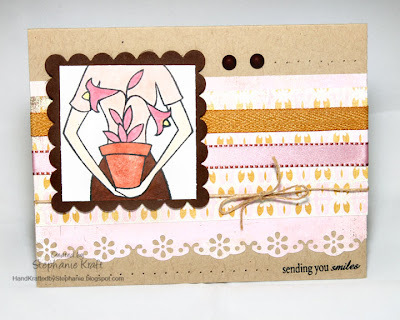 I used Vicki's TECC52VC sketch for my card below. I kept this one simple and didn't add a lot of layers or stitching. I just love this image of Who's That Girl from My Favorite Things. It was released as a Mother's Day stamp set, but the image is versatile for so many different occasions as well! Accessories: Square Nestabilities (Spellbinders), Cuttlebug (Provo Craft), Markers (Copic), border punch (Martha Stewart), candy dots (Pebbles), ribbon, hemp, paper piercer, foam tape.